Dean called over on Sunday for a game of Wings of Glory, it was our first game of the new year and I just wanted something quick and easy to set up and play. I decided on using one of the observation balloons that I have stored away with the Germans defending it and the Allies trying to bring it down. For the defence forces I had three Pfalz DIII (my favourite WW1 aircraft). However, one of my plane's guns jammed and the group split apart. Dean appeared to be attempting to draw my fighters to follow his SE5as, whilst the Nieuport got set up for his attack run with the rockets. I manoeuvred a Pfalz to fire at the attacking Nieuport but quickly came under fire from one of the SE5as, which led to smoke billowing out of the engine of my scout! With my scouts now heading away from the balloon they were meant to be protecting I flipped them all over and began closing in on the Allies again. However, the Neuiport began his rocket attack against the balloon whilst it was also being strafed by an SE5a! The SE5a attack set the balloon alight whilst the rocket did nine points worth of damage! Things were not looking good from the defenders point of view now... Fortunately I fell upon a single SE5a with my wolfpack and riddled it with bullets. This little melee broke apart with one of my Pfalz hot on the tail of the SE5a. Another Pfalz broke off to pursue the Nieuport before he could do any more damage. Then began a three plane pursuit, my Pfalz blatted away for all he was worth but the SE5a was soaking up the punishment. Meanwhile, another SE5a was hard on the Pfalz's tail and gunning for him! Despite me hugging the tail of the SE5a it wouldn't go down! I felt that I was getting drawn away from the main focus of the game, namely the balloon, this was Dean's intention (he told me afterwards...). So I flipped the pursuing Pfalz, which fortunately brought him back into sight of the other SE5a! This attack proved more successful with the SE5a bursting into flames under the guns of the Pfalz. And another of my scouts took position to blast away at the already damaged SE5a. Meanwhile, the Nieuport was destroyed by the third Pfalz's accurate shooting. With the balloon burning fiercely it finally gave up the ghost and exploded taking the already damaged SE5a with it! It was all over with a victory to the Allies, despite losing two of their aircraft. It was another good game of Wings of Glory and having the balloon on the board added another dimension to the the scenario and gave us both something to work towards. Then Ninjasaurus Rex showed up and we decided on playing a game of Cthulhu Munchkin. We also press-ganged Clare into taking part and had a four player game. 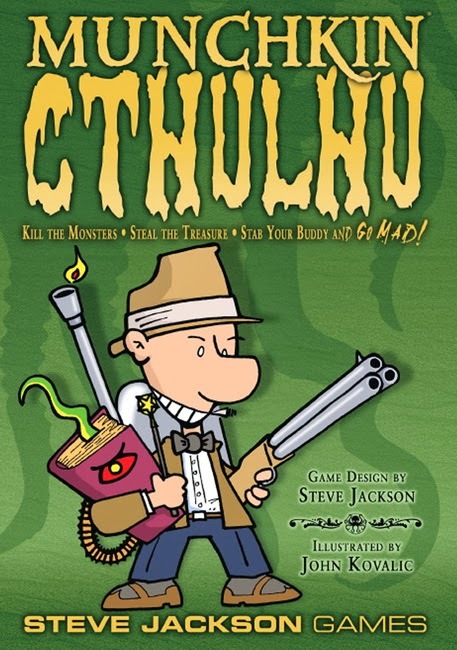 I had picked the game up in a sale just after Christmas and have wanted to play it for a while hearing a lot of good things about the original Munchkin. As Dean had played Munchkin previously, he took us all through and it wasn't too long before we all had the hang of it. I really enjoyed it, but need a few more games to get the hang of how things work properly. Ninjasaurus Rex won, through fluke rather than skill, but as it was his 40th Birthday it was a deserved victory. The day was then finished off with an Indian meal in honour of NR's birthday (go wish him many happy returns on his Blog!). Splendid scrap, that one, Alex. The balloon looked to add a lot of fun to the game. I'm loving the terrain mat as well - sorry, I should have mentioned that many, many posts ago! Thanks Sidney, yep it was a belter for a quickly put together scenario! The mat comes from Terrain Mat, so all the hard work is down to them! Over Paid, Over Sexed and Over Here!